New season, new lipsticks! Change can be hard to embrace. However, switching up your lipstick is one of the easiest things you can do to spice up your routine and change your look a bit. Plus, trying on new lipstick is so much fun! I’ve been a lipstick lover for years and I still get a little carried away when I come across new lipsticks. 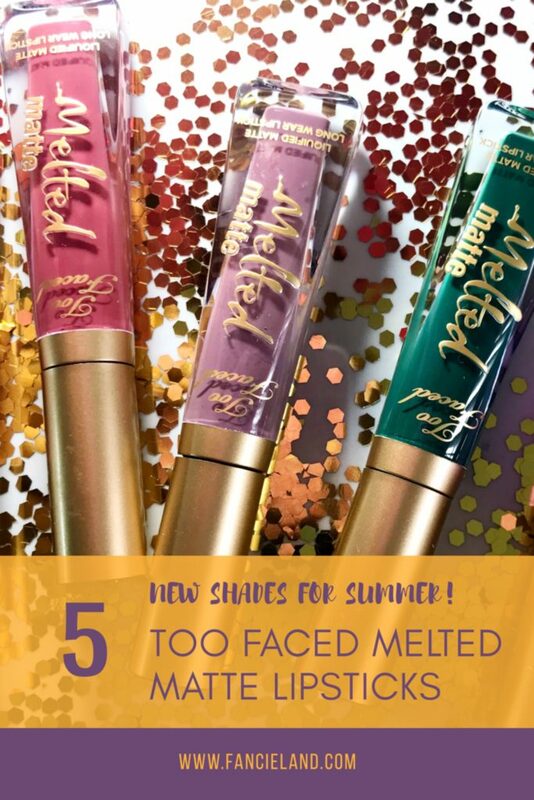 Like the new shades Too Faced added to their Melted Matte Lipstick lineup. There’s a lot of liquid lipstick formulas out there. However, the Too Faced Melted Matte Lipsticks are one of my favorites. Hands down! The Melted Matte Lipsticks are intensely pigmented, creamy and easy to apply. They’re also rather long wearing too without sucking all the moisture from my lips. I’ve always had great luck with the Melted Matte Lipsticks so I was all over the new shades Too Faced whipped up for summer. Too Faced added 6 new shades in total. And, of course, I own all 6 of them! Unfortunately, I’ve managed to lose one in my room somewhere so I only have 5 of them to show you today. I’m not going to lie. I’m slightly salty about misplacing a freaking $21 lipstick. Still, I figured I’d show you guys how these beauties looked before all the lettering wore off in my makeup bag. Because I plan on wearing the crap out of these babies! Too Faced is known for keeping it natural but the ever so bold Wicked is the clear star of the show here! More and more mainstream brands are taking a walk on the wild side releasing more funky, non-traditional makeup colors. I’m loving it! I’m hella excited to see brands taking a step outside the box and pushing people out of their comfort zones. Makeup is meant to be fun! Green lipstick isn’t for everyone. But I can’t think of anything more fun than a poppin’ green lip this summer!